Since she first captured fans’ hearts in 2008 with her first album, “19”, Adele has been known as much for her full figure as she is for her stunning voice. However, since having a baby in 2013, the songstress has been on a steady journey to lose the weight. It all started just four months after she gave birth to her baby, Angelo, when Adele graced the red carpet at the Grammy Awards with a much slimmer waistline. Since then, she’s been showing significant and consistent progress, and she looks better than ever. So how does she do it? And how did she kick-start the process to lose the baby weight and more? 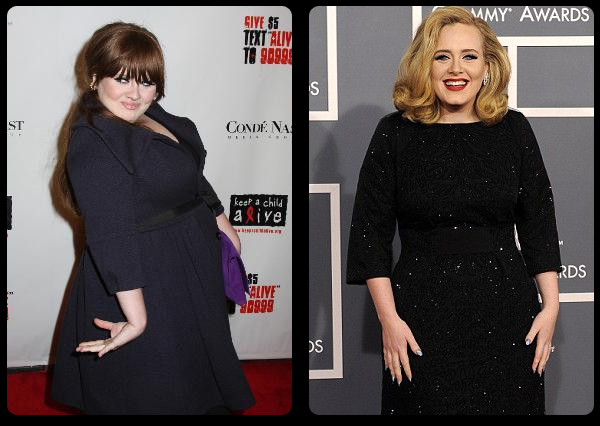 When she struck out to lose her baby weight, Adele started a strict vegetarian diet. She’s admitted that she thinks tofu is terrible, but she finds other ways to get lean protein without eating meat, and she eats lots of vegetables. When she’s tempted to eat meat, she says, “I always see my little dog’s eyes.” That’s some pretty good motivation to keep eating a plant-based diet! Of course, her diet wasn’t all that Adele changed. She also started regularly jogging, and as she got more accustomed to consistent exercise, began running more and more. Eating well and getting consistent cardiovascular workouts in started a whole new lifestyle for the singer. Today, Adele says that she’s continued to lose weight by cutting down on sugar in her diet. She also only has a single alcoholic beverage per week, which helps her cut down on empty calories and sugars. It also prevents the alcohol from messing with her metabolism, and we all know how a night out drinking can lead to a lot of greasy food in the morning, so she’s saving herself from temptation, as well. In addition to her running habit, Adele has also taken up training with weights at the gym. This helps her build more muscle, which will help her burn even more fat when she goes for those runs, and even when she’s sitting at home or working on a new song in the studio. Essentially, Adele’s weight loss secret is pretty simple. Instead of going on a crash diet or following diet and exercise fads, she made a couple of simple changes that led to a larger lifestyle change. From going vegetarian and running a few times a week to working out in the gym and cutting way down on added sugars, this incredibly talented star has lost a lot of weight over the past three years. So what’s Adele’s weight loss and diet secret? Consistency and patience through a gradual lifestyle change that she’s completely embraced. Changing to a vegetarian diet helped her avoid a lot of the foods that were helping her pack on the pounds, and running helped her get in the mindset of doing something good for herself every day. These two simple things set her on the path to major weight loss and a healthier lifestyle. What do you think? Could you do the same?